A Nordmann Fir tree is a great way to create a unforgettable, magical Christmas! Unparalleled in beauty and and durability, Nordmann Fir Christmas trees have been popular in Europe across the ages and are gaining even more popularity in the United States. The Nordmann Fir Christmas tree, or Abies nordmanniana, has excellent needle retention qualities offering you a perfect choice for your holiday decorating needs. 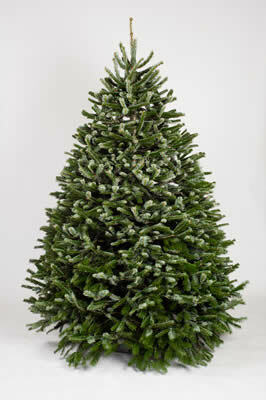 Impress your guests with the Nordmann Fir Christmas tree that is ensured to look good and stay fresh with proper care. Named after a botanist from Finland, Alexander von Nordmann, who discovered it growing in Georgia, the Nordmann fir has a longer lifespan than other firs making it your long lasting-beautifully decorated companion over the holiday season. Originally a native of Turkey, Georgia, Northern Armenia, the mountains around the Black Sea, and the Russian Caucasus, in recent years, the Nordmann fir has proved an excellent species for growing at our Oregon tree farms. Today, the Nordmann Fir is favored for its attractive foliage, softer needles, and its resistance to shedding needles as the tree dries. It has also become a great choice for some families where allergies or sensitivity to the typical Christmas tree armoma is a concern as the Nordmann lacks fragrance. Enjoy a Nordmann Fir this season as the focal point for your families Christmas celebration! For larger trees, see Big Trees.